At an all-school assembly in January, Kingsland Elementary School in Ark. received a $5,000 technology grant from the Foundation for Rural Education and Development (FRED). 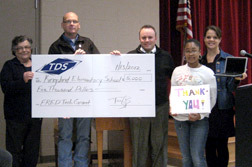 TDS, a supporting member of FRED, presented the check to program coordinators, teachers and school administrators. TDS also surprised the school with five Dell Netbooks. Kingsland applied for—and was one of only seven schools in the U.S. to receive a FRED technology grant. The grant makes it possible for the school to offer students (of which 4-out-of-5 are eligible for the federal free/reduced meal program) more technology-based learning opportunities. The tools McGee mentions include LabQuests and digital scales for earth, physical, and life science projects. Students will be recording movement, speed, energy, and direction changes and then comparing them through computer graphing. The digital scales will enable the students to collect accurate weight readings, which will then be compared to weight readings from spring scales, balance pans, and triple beams. The FRED grant program, now in its tenth year, awards funds to public schools working in cooperation with their local telecommunications companies to increase the use of technology to enhance the learning experience. Check out FRED technology grant program for more details.